Always a keen traveller and with feet growing ever itchier, Burkitt moved to New Zealand in March 2014. He’d fallen in love with the people, the natural and musical scenery and above all… the fly fishing! 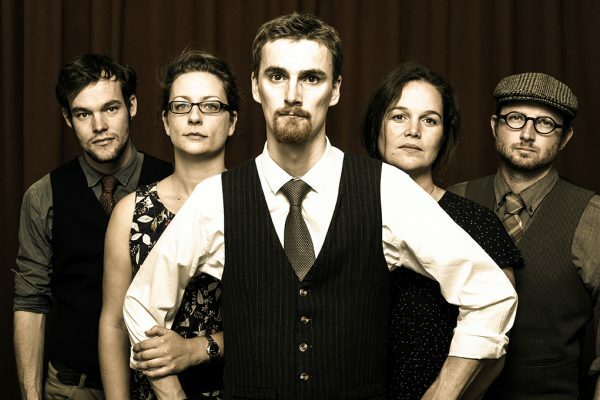 After settling in Wellington, Frank Burkitt was quick to form ‘The Frank Burkitt Band’ which includes Cameron Dusty Burnell (Mandolin), Krissy Jackson (Fiddle), Kara Filbey (Backing Vocals and Percussion) and James Geluk (Double Bass). Now the main project for Burkitt, the band give his songs vibrancy and their virtuosic solos beautifully accompany his original vocals. They have been impressing audiences across New Zealand having completed a sell out 27 date national tour of the country promoting their first album ‘Fools and Kings’. This album contains a wide variety of genres which gives it a fresh and unique sound and it is by far his most accomplished work to date. Although all the songs were written by Burkitt, the album was a joint effort with the arrangements done by the band as a whole and the album partly produced by Graeme Woller (Into The East). Now well known for entertaining story-telling, tightly arranged songs and delicious harmony and a set list that contains blues, country, bluegrass, swing and some Scottish folk. It is good old fashioned original song-writing backed up by a band that understands perfectly how to add infectious rhythm and groove (Geluk’s bass), varied and skilled solo breaks (Burnell and Jackson on fiddle and mandolin) and endorphin-exploding harmonies (Filbey on backing vocals).